With the MAN Engine Academy, its new training center at the International Engine Competence Center in Nuremberg, MAN Truck & Bus continues its quality offensive. The newly established training center is used by MAN to train service personnel in the correct handling of MAN engines. MAN is known for high-quality products and its proximity to customers. The efficient and powerful engines operated in applications other than MAN commercial vehicles also convince, thanks to their ruggedness and long service lives. In order to keep the idle time lost to the customer during repair and regular servicing at a minimum, experienced specialists at the new MAN Engine Academy at the Engine Competence Center in Nuremberg give three- to five-day training courses to the service staff of Sales partners and certified Service outlets. All aspects of theory and practice focus on the function, diagnostic strategies and servicing of the MAN engines that perform, for example, in agricultural machinery, railway applications, combined heat and power plants or working vessels. 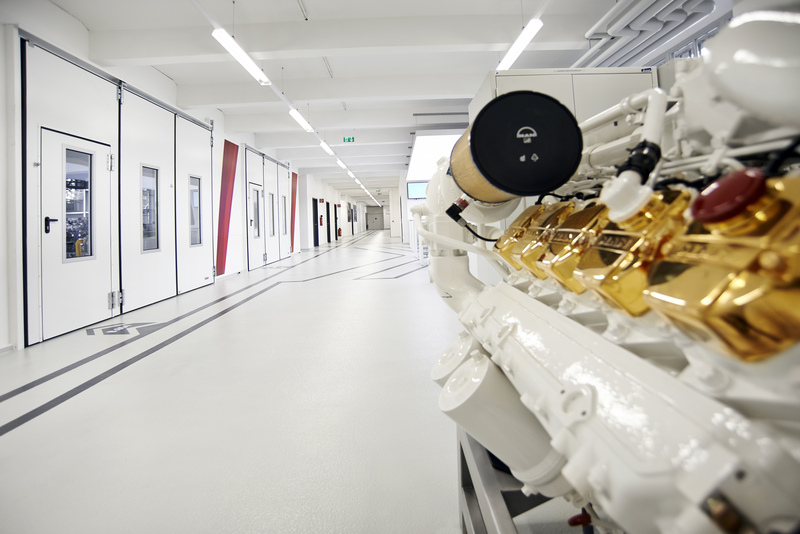 For Reiner Roessner, Head of Sales MAN Engines, the new MAN Engine Academy is a further step to ensuring the quality of engine servicing: "MAN guarantees the highest level of quality, not only of its products but also of its service. For this reason, service personnel with first-class training are extremely important to us. With the expanded training program offered by the MAN Engine Academy we are contributing importantly to making practical know-how on all MAN engines available." Since the beginning of this year, up to four trainings have been taking place simultaneously in the over one thousand square metres of the MAN Engine Academy. The rooms have been completely redesigned and are equipped with modern instruction material for the theoretical contents and a full array of training equipment for practical exercises, ranging from operable engines for the application currently being trained to mock-ups of the operator's platform. The two integrated training test benches enable engines to be run under realistic conditions and an unlimited number of fault situations to be simulated. Reiner Roessner is satisfied with the expansion of what is offered in the way of training: "With the new MAN Engine Academy we offer our course participants the ideal learning environment and even more opportunities to make themselves familiar with our engines. The newly designed rooms with their state-of-the-art equipment underscore our high standard of quality." The new MAN Engine Academy is one of a series of investments MAN has made in the Nuremberg site over the past few years. Of those, the biggest have been investments in the future. With the opening of the new Development Center in 2010, the laying of the foundation stone for the new Sequencing Center in 2012 and the extension of the Development Center currently taking place, sustainable steps have already been taken. In the next phase, the MAN Engine Academy now improves service quality. The Academy is housed in the "Loftwerk", a building adjacent to the plant premises that has been leased especially for this purpose and where quality competence has recently been consolidated. The new MAN Engine Academy offers course participants the ideal learning environment. The rooms in the MAN Engine Academy are equipped with modern instruction material for the theoretical contents and a full array of training equipment for practical exercises.